Here are some example rules to help you get started. Templates allow you to create your email design and store commonly used content to re-use for different transactional emails. You can store templates in Mandrill and then send email using the template and providing dynamic, recipient-specific content. The following rule applies the template verify-email to any messages that have the word verification anywhere in the subject line and places the message content into the editable template block called main. Now, when you send a message with a subject line like "Your verification email from domain.com", this rule will be applied. 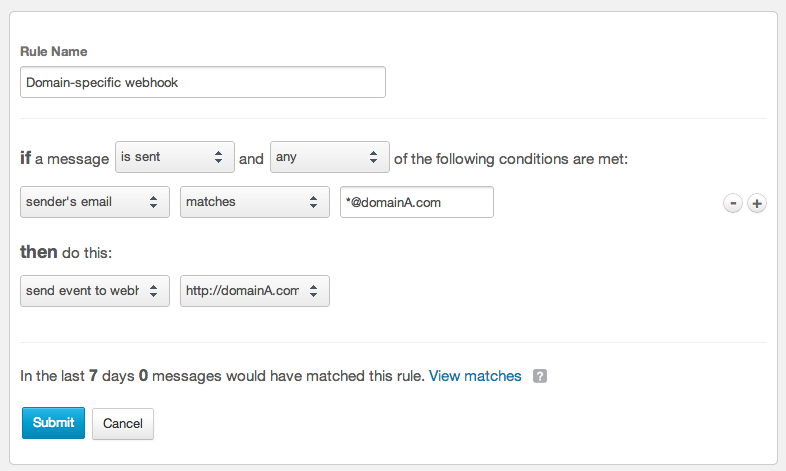 Mandrill allows you to add email addresses to your Rejection Blacklist manually, but adding an entire domain isn't supported. 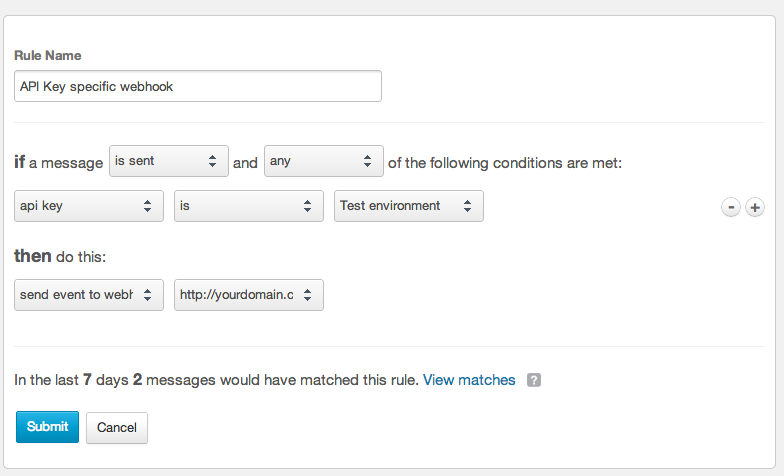 You can set up a rule to reject any emails from a particular domain. 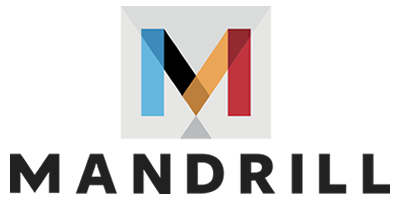 For example, you may be sending test emails to a domain that doesn't exist or attempting to block unwanted senders from relaying email through your Mandrill account. Sometimes you want to make a change to your email, but you're not sure if the change will be effective. Will recipients open and click more, or will they click less? Maybe you want to do an A/B split test on your change, or maybe you want to limit the change to some small percentage of your emails as a trial. 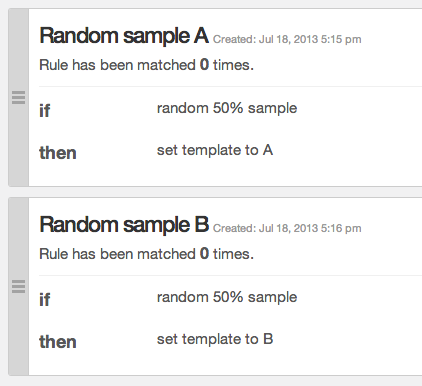 Sse random sample as part of your rule conditions, along with to the other criteria for the rule. Then, take actions like changing a template or modifying Google Analytics tracking, and those changes will only apply to that random subset. After the test is generating data, use stats comparison reports to chart and compare the differences between the groups. When you're ready to pick a winner, just change the winning rule to match all the time and delete the others. 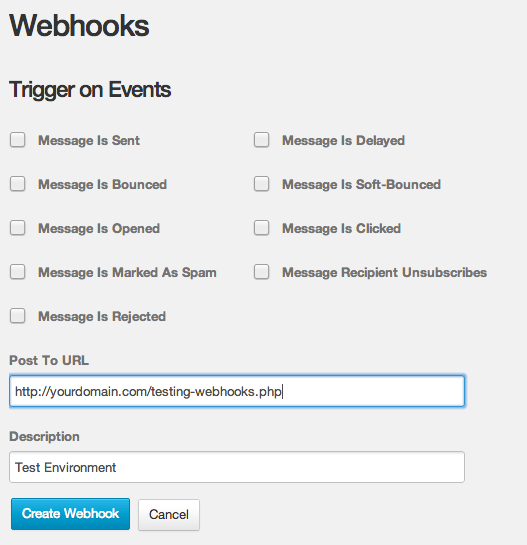 You'll need to create a new rule for each event that you'd like to receive information about (sent, bounced, opened, etc. ).